Bauhaus sounding blocks. | Noted. I discovered these blocks at the Bauhaus museum in Berlin. 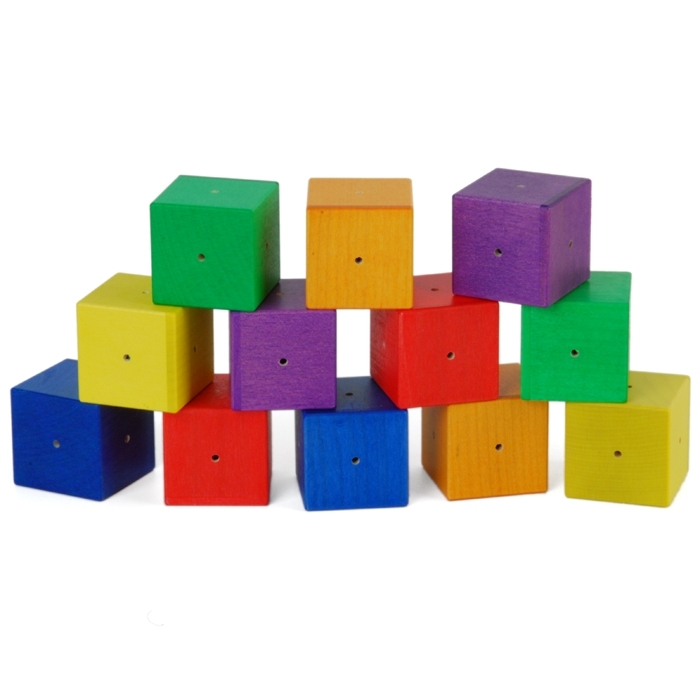 So simple, each block has a different material inside — making different noises when rattled. In a world where we can become over-stimulated with beeps and whizzes, it is amazing how satisfying it is to jiggle each one. Sparking wonder. Instant joy. A special gift for anyone with child-like curiosity. rings in 12 cubic blocks and rattles it, which have a few same color and same sound. children from 1 year can with this little kit first experience in the stack with a make basic form. accompanied by the sound of the dice. the acoustics will be trained: blocks of the same sound can be associated with each other. strong rainbow colors from yellow to blue help with the assignment. a block game that meets the assumptions of the bauhauslers, who have dealt with the design of toy: the game is to prepare joy while fulfilling an educational purpose. as material was already at that time related mainly wood in bright colors. kept the 4 x 4 x 4cm large stones in a soft cotton bag. a nice entry into the world of shapes, colors and sounds.